Empress Pavilion, Chinatown’s beloved dim sum parlor of 25 years, closed last year but has been reopened by Ocean Seafood owner Andy Lau. Expect the same traditional dim sum, with rolling carts, in a revamped dining room. Breakfast, Lunch & Dinner daily. Empress Pavilion, 988 N. Hill St., Los Angeles, CA 90012, 213-617-9898. Shanghai Rose has replaced the former Chi Dynasty outpost in Studio City, now serving daily dim sum, along with other traditional Chinese dishes like honey-walnut shrimp and Beijing duck. Guests can watch the chefs work in the open kitchen. Lunch & Dinner daily. Shanghai Rose, 12229 Ventura Blvd., Studio City, CA 91604, 818-762-2542. Wally's, the wine and spirits shop, has turned the former space of monsieur marcel in Beverly Hills into Wally's Vinoteca. Wally's Vinoteca, 447 N. Canon Dr., Beverly Hills, CA 90210, 310-475-3540. Native Corsicans chef Olympe Ricco and Cedric Savelli and have opened the first Corsican eatery in Los Angeles, Napoleon & Josephine, on Melrose Avenue. Dishes include Corsican-style veal stew, wild-caught black cod and goat cheese cannelloni. Expect wines from Calvi, Figari, Sartene and Patrimonio. Dinner Tues-Sun. Bunker Hill is the location of downtown’s new Pez Cantina, a sprawling “coastal Mexican kitchen” with specialties from the Yucatan, Baja and Oaxaca. Chef/owner Bret Thompson (Patina, Milk) turns out sustainable, fresh ceviches and cocteles, fish tacos and dishes like tamarind-glazed baby back ribs, shrimp taquitos, cochinita pibil and crispy skin chicken. The patio offers handmade cocktails, including specialty margaritas, and there’s a selection of California-focused wine and craft beers from California and Mexico. Lunch Mon.-Fri., Dinner Mon.-Sat. Pez Cantina, 401 S. Grand Ave., Los Angeles, CA 90071, 213-258-2280. Echo Park has a charming new farm-to-table eatery, Ostrich Farm, on Sunset Boulevard. Expect flatbread with Stilton and truffle oil, rough-chopped chicken liver on toasts, Dungeness crab salad with radish and grapefruit, and braised beef pot pie. The wine and beer list is small but select. Dinner Tues.-Sun. Ostrich Farm, 1525 W. Sunset Blvd., Los Angeles, CA 90026, 213-537-0657. Chef Neal Fraser has opened Redbird in the old rectory building at the historic St. Vibiana Cathedral in downtown Los Angeles. Fraser, wife Amy Knoll Fraser and restaurateur Bill Chait (République, Bestia, Petty Cash Taqueria, etc.) currently operate Vibiana, a special events venue at the cathedral. The space features an outdoor dining area with retractable roof, as well as an indoor lounge offering cocktails from mixologist Julian Cox. Redbird, St. Vibiana Cathedral, 214 S. Main St., Los Angeles, CA 90012, 213-788-1191. Cary Hardwick and Laurie Sisneros, owners of Spaghettini in Seal Beach, in conjunction with renowned saxophonist Dave Koz, opened their new Beverly Hills restaurant, Spaghettini & the Dave Koz Lounge. The restaurant offers refined California-inspired Italian cuisine in a state-of-the-art music venue. Executive chef Scott Howard’s menu features signature Spaghettini dishes from Seal Beach, including Parmesan-crusted Chilean sea bass, as well as new locally inspired Italian dishes such as Santa Barbara sea urchin with cucumber, jalapeño and pickled cherry, and orecchiette with six-hour Kurobuta pork bolognese, porcini mushrooms and Pecorino. Spaghettini & the Dave Koz Lounge, 184 N. Canon Dr., Beverly Hills, CA 90210, 310-424-4600. Chef Ben Ford has opened an outpost of Ford’s Filling Station at JW Marriott Los Angeles L.A. Live. The restaurant took over the space of LA Market and serves breakfast, lunch and dinner daily. This is the second location of Ford's Filling Station, joining a branch at Los Angeles International Airport (the original Culver City gastropub has closed). Ford's Filling Station, 900 W. Olympic Blvd., Los Angeles, CA 90015, 213-765-8630. The Horn, West Hollywood’s newest steakhouse, is a bar and lounge that specializes in steaks, game and cocktails, courtesy of executive chef Adam Mitrano, a Gordon Ramsay alum, and Adam Klesh (Industry Bar, NYC.) Expect crispy alligator nuggets, a roasted pig head, pork belly chili and wood-grilled boar chop, along with salmon, mussels, pasta and burgers. Craft cocktails include a rhubarb Negroni and blackberry/elderflower Pimm's Cup accented with tarragon. The Horn, 8933 Santa Monica Blvd., Los Angeles, CA 90069, 310-933-6678. The Houston Brothers (La Descarga, Harvard & Stone) have made a foray into restaurants with an American bistro, Butchers & Barbers. Luke Reyes (The Corner Door) is helming the stoves, turning out habanero mussels, lamb sausage, house-cured charcuterie and a côte du boeuf for two. Don’t worry, there will still be fancy cocktails. Dinner Tues.-Sun. Butchers & Barbers, 6531 Hollywood Blvd. , Los Angeles, CA 90028, 323-461-1464. A new project from Stéphane Bombet (Faith & Flower, Picca), Terrine features the cuisine of chef Kris Morningstar (formerly of Ray’s & Stark Bar). 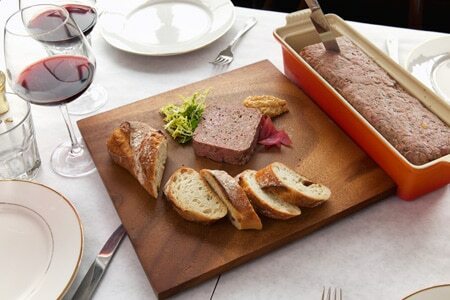 Terrine, 8265 Beverly Blvd., West Hollywood, CA 90048, 323-746-5130. In Venice, chef-owner Travis Lett’s (Gjelina) Gjusta is a gorgeous new gourmet deli/bakery with burgeoning café space on deck. Find house-made pickled herring, smoked fish and charcuterie, breads and pastries, duck confit and artisan pickles. The espresso comes from a big La Marzocco machine. In the future, anticipate beer and wine, along with dinner hours and more seating. Breakfast & Lunch Tues.-Sun. Gjusta, 320 Sunset Ave., Venice, CA 90291, 310) 314-0320. Chef Ricardo Diaz (Colonia Taco Lounge, Guisados) is teaming up with Adam Fleischman (Umami Burger) to open Tacoteca, a mezcal and taco lounge in Santa Monica in the former Charleston space. Expect grilled octopus tacos with serrano-peanut salsa, duck tacos, pork belly chicharron quesadillas, and a fine mezcal list, alongside specialty mezcal cocktails. 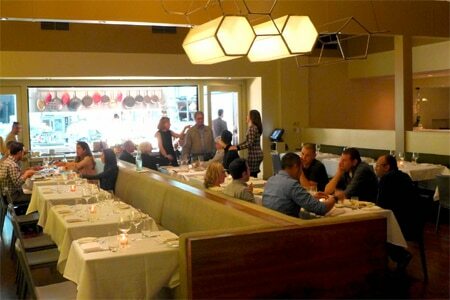 Tacoteca, 2460 Wilshire Blvd., Santa Monica, CA 90403, 310-828-2115. Pitfire Artisan Pizza has brought its wood-fired offerings to Pasadena with its eighth restaurant. Located Old Town-adjacent in the former Sizzler location on Arroyo Parkway, Pitfire is the brainchild of owner Paul Hibler, of Superba renown. 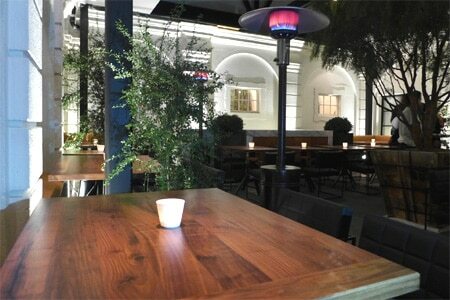 Indoor and outdoor seating are available, the indoor focus being Pitfire’s signature wood-fired kiln. While pizzas take center stage, including one made with house-made burrata, menu options feature spaghetti with chicken meatballs and a variety of handmade salads. The full bar is stocked with an array of wine and beer, in addition to cocktails, both classic and seasonal. There is ample space for group gatherings, children’s birthday celebrations and pizza-making parties. Pitfire Artisan Pizza, 730 S. Arroyo Pkwy., Pasadena, CA 91105, 626-376-9005. Restaurateur/chef partners Jon Shook and Vinny Dotolo (Animal, Son of a Gun) have another Fairfax restaurant coming down the pike in 2015, called Jon & Vinny’s. The concept will also feature a wine store overseen by Helen Johannesen. Jon & Vinny's, 412 N. Fairfax Ave., Los Angeles, CA 90036, no phone. Koreatown plays host to a new restaurant from Gary Menes, Le Comptoir (which means “the counter,”) in the refurbished Hotel Normandie. The modern, intimate space seats just 10 diners for a chef’s tasting menu five nights a week. Dinner Tues.-Sat. Le Comptoir, Hotel Normandie, 605 S. Normandie Ave., Los Angeles, CA 90005, no phone. Chef Josef Centeno (Baco Mercat, Orsa & Winston) reopened Pete’s Café as Pete’s in DTLA’s Old Bank District, then soon after changed the name of the restaurant to Ledlow Swan. The menu offers dishes ranging from caramelized cauliflower to crispy pork belly with spinach and fried egg, and braised beef shoulder served family-style. Ledlow Swan, 400 S. Main St., Los Angeles, CA 90013, 213-687-7015. Firefly has opened its sprawling patio to Sunday brunch-goers for the first time, with a sunny outdoor setting perfect for chef Paul Shoemaker’s signature dishes. They include shrimp and creamy polenta with poached egg, scrambled eggs with Burgundy truffles, and Maine lobster Benedict. To drink, there are fresh-pressed juice, and customizable mimosas and Bloody Marys. Firefly, 11720 Ventura Blvd., Studio City, CA 91604, 818-762-1833. West Hollywood’s fanciful La Boheme is now under the management of Global Dining, and has welcomed new executive chef Martha Esquivel (Border Grill). New menu items include Catalan octopus with saffron, ahi tartare with cucumber and yuzu, duck breast with black lentils, and beef tenderloin with corn soufflé. 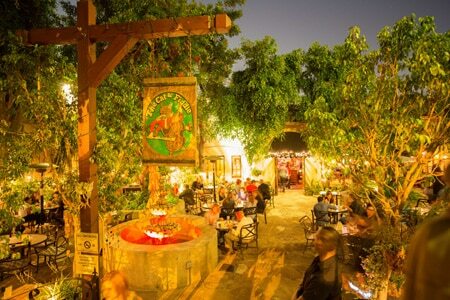 La Boheme, 8400 Santa Monica Blvd., West Hollywood, CA 90069, 323-848-2360. The Studio City location of Chi Dynasty has closed and been replaced by dim sum eatery Shanghai Rose. Chi Dynasty, 12229 Ventura Blvd., Studio City, CA 91604, 818-980-3888. Chef Brendan Collins’ popular Culver City gastropub, Waterloo & City, will be closing the last week of January 2015. Collins plans to reopen later in 2015 in a smaller location. The current space will open as The Hatchet Hall in the spring. Waterloo & City, 12517 Washington Blvd., Culver City, CA 90066, 310-391-4222. Paiche, the Peruvian restaurant established by Ricardo Zarate, closed after December 31, 2014. It will re-open with a different owner and chef as a seafood concept in February. Paiche, 13488 Maxella Ave., Marina del Rey, CA 90292, no phone. Mo-Chica has closed. Chef Ricardo Zarate's original incarnation of Mo-Chica was situated at the Mercado La Paloma, and the Peruvian eatery was later reinvented at this downtown location. Mo-Chica, 514 W. 7th St., Los Angeles, CA 90014, no phone. Venice favorite Axe has closed after 15 years on Abbot Kinney Boulevard. Owner Joanna Moore states she will move on to new projects. No word yet on what will happen to the space. Axe, 1009 Abbot Kinney Blvd., Venice, CA 90291, no phone. Hollywood's beloved watering hole The Cat & Fiddle has closed. The restaurant is looking to move into a new location. The Cat & Fiddle, 6530 Sunset Blvd., Hollywood, CA 90028, no phone. Ilan Hall’s popular Los Angeles restaurant, The Gorbals, has left its current location in the Alexandria Hotel with plans to move to another, yet unspecified, DTLA location. Hall has also recently opened a sibling to The Gorbals in Brooklyn. The chef plans to move away from offal and meat dishes and focus more on vegan offerings. The Gorbals, The Alexandria, 501 S. Spring St., Los Angeles, CA 90013, no phone. Chef John Rivera Sedlar closed his downtown restaurant Rivera after December 31, 2014. Sedlar will be moving to Santa Fe, New Mexico, to open his new restaurant ELOISA. Rivera, Met Lofts, 1050 S. Flower St., Los Angeles, CA 90015, no phone. Aburiya Toranoko in Little Tokyo is closed for remodeling. Aburiya Toranoko, 243 S. San Pedro St., Los Angeles, CA 90012, 213-621-9500. Richard Sandoval’s Latin spots La Sandia and Zengo, located atop the third floor of Santa Monica Place, will close in March to make way for a new location of The Cheesecake Factory. La Sandia, Santa Monica Place, 395 Santa Monica Place, Santa Monica, CA 90401, 310-393-3300. Karen and Quinn Hatfield’s beloved restaurant Hatfield’s will close at the end of December 2014. The couple will continue their culinary explorations with their bakery café The Sycamore Kitchen, and open a new casual grill restaurant, Odys & Penelope, on La Brea in January. Hatfield's, 6703 Melrose Ave., Los Angeles, CA 90038, 323-935-2977.